Nowadays, with multiple functions integrated in one, mobile phone is more than a simple device used for phone calls and message texting. With it, you can freely chat with anyone as you wanted and needed. More importantly, you can use it to take photos or shoot videos when you want to memorize some special moments or enjoy music songs when you are tired of the boring life. Then it is quite natural that more and more media files will be saved in your Samsung phones with time passing by. You will find that less and less files are available for any new files or downloads. What's worse, any possible mishandling may lead to the data losses saved in your device. So, here you have every valid reasons to back up your Samsung media files, which represent the beautiful old times and precious moments. Then you can delete some insignificant files from your phone to save more free space. More importantly, after backing up the important media files, you can totally free yourself from troubles of losing files all of a sudden. Don't know how to transfer the large amount of media files from Samsung phones to PC/Mac computer? With this Android Assistant, things can't be easier! This software allows you to quickly transfer all media files from Samsung phones to computer, be it PC or Mac. So you won't need to worry about sudden data losses anymore. 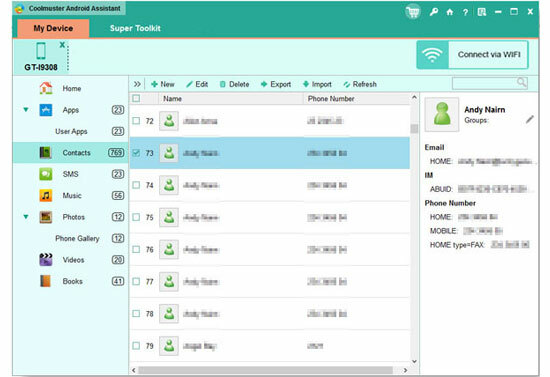 More importantly, this software can also support other types of files including files saved in the internal memory and SIM card like contacts and messages. So now, want to give it a try by yourself? Get the right version and try it out now! To start with, open the installed software on the computer and then get your Samsung phone connected to the computer via the USB cord. This software will detect your device and show you an interface as pictured in the below. Now, you can enter the file folders on the left panel to preview more detailed information on the right window. In this case, you can go to Music, Photos, Videos folders to preview and choose files you want to transfer from Samsung phones to computer (PC/Mac) as a backup in one click. Finally, just wait for the process to get completed within a little while. Can't wait to transfer media files from Samsung phones to the computer (PC/Mac) now? Just go ahead!